Note: This text is a transcript of the words spoken in the video below. When you think of a Corvette what do you think of? Freedom? More Horsepower than brains? Maybe, but you probably also think of a 40 something year old man with thinning hair and an expand mid section. But why is this? 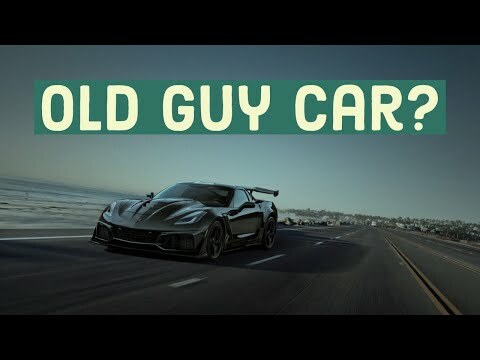 Why is the Corvette thought of as a mid-life crisis car? Historically, Chevrolet has marketed the Camaro as the performance machine for younger buyers. After all, what would high school be without stuffing four of your friends in the backseat of a Camaro? The Corvette is an aspirational vehicle for guys wanting to relive the glory days. Although, now you usually don’t care about driving friends places, they should have their own cars by now. The Corvette is often the sports car of choice for former Camaro owners with a bit more cash. The fact that a Corvette only seats two keeps many folks younger than their mid-40s from being able to consider a Corvette. Once you have kids to haul to soccer practice, two seats just don’t work. These little ones will also drain your bank account keeping the ‘Vette dream just that. For younger buyers with a bit more cash the stigma of the Corvette being an old guy car keeps most away. These buyers will instead go for the high performance muscle car variants or European rivals. In turn this keeps the stigma going as you keep seeing the guy with grey hair getting out of the car. Corvettes are often driven by older guys and that’s a shame. They may not be quite as poised as a similar era Porsche 911, but there is no better sports car performance value. For those worried about price, the price of a well maintained 350 horsepower C5 is under $15,000. You can even get a C4 for less than $10,000 and with these prices it becomes a car that all enthusiasts should consider. Of course I’m an old guy and have started to desire a Corvette, so the youngsters may have a different opinion.